A relationship with a sociopath can drain you emotionally, and often, financially. You may not notice the subtle warning signs early in the romance, and the longer you stay with someone, the more challenging it can be to disentangle yourself. Mayo Clinic notes this disorder is associated with severe early childhood trauma, genetic factors or a combination of the two. Symptoms can be present during early childhood, but most individuals don't run into problems until they are teenagers. Many teens will first be diagnosed with conduct disorder, followed by anti-social personality disorder after they turn 18. Although the majority of people who have this diagnosis are men, women too may struggle with this disorder. Research, published in the journal Personality Disorders, shows a three to one prevalence ratio, with women presenting as less violent than men, but more aggressive. Life with a sociopath starts out spectacular. With his dazzling charm, he will work diligently to win your love and trust. Once he has captured you under his spell, he will begin using you to get whatever he wants when he wants it. When you catch her in her lies, she will seem genuinely sorry and it will be hard not to forgive her. She will again turn on the flattery she demonstrated when she first captured your heart and you may once again stay trapped. Over time, your partner may feel that you are on to him, and may decide to move on to his next victim before you expose him. Sociopaths have little to no empathy, despite behaving as if they do. You may not know all the tactics he is up to because he is incredibly well versed at reading and manipulating people. Many of these individuals are pathological liars, using their stories until they no longer work for them. They typically strive to keep their images perfect because if they are exposed they can no longer get what they want or need. Often they engage in an abusive tactic called crazy-making or gas-lighting, meaning that they set their partner up to slowly feel like they are losing their minds. For example, she may leave the faucet running and blame you. Over time, you may start to believe that you are the one who is constantly leaving the water running. This creates a dependency on the abusive person, leaving the victim feeling like she can't function without him. This is how you get trapped. Sociopaths can form strong bonds with people and are capable of love, yet this doesn't erase the other issues involved with their personality. They may not realize - or care - how their actions hurt their "loved ones," causing their partners to question if love is truly present. So while sociopaths can indeed experience love, it's not the same kind of love neurotypical people feel that involves caring and empathy. A relationship with a sociopath is most likely to succeed when the partner sets clear boundaries and sticks to them. This isn't to say that the relationship will be fantastic and ideal as long as boundaries are present, but rather that the relationship is more likely to continue as long as these clear boundaries are in place. Sociopaths may confide in a partner and admit their faults which can lead to a potential for closeness and growth, but in general, sociopaths do not like to expose their own psychopathologies. You should first examine what it is within yourself that allows you to feel comfortable in a romantic relationship with a sociopath - someone who will probably be controlling and unpredictable. Perhaps you thrive when embroiled in drama, or perhaps you fell in love with the facade initially presented by the sociopath. Whatever your reasons, if you choose to remain in a relationship with a sociopath, realize that you are welcoming a complicated partnership. As mentioned above, setting clear boundaries is paramount in navigating a relationship with a sociopath. Don't waffle from the boundaries and allow deviation from your expectations; if a sociopath recognizes a weakness they will likely capitalize upon it. For example, if you set the boundary of, "If you cheat on me, I will leave you," and then you don't break it off when they cheat, it's likely more cheating will happen in the future. A sociopath has issues within their brains that make them think the way they do and don't always set out to hurt the people around them. Just as you wouldn't get angry at a person with a sprained ankle who can't run a mile with you, you also shouldn't be angry at a sociopath's behavior when they do things characteristic to sociopaths. You simply can't expect reasonable behavior from someone who's brain compels them to be unreasonable. This doesn't mean you have to accept abuse, but it does mean you should understand your sociopathic partner's behavior won't always be "normal." If you are still in a relationship with the sociopath, you may believe you love him and that he can change. You may think back to the beginning of the relationship when he was very charming and enjoyable to be around. Many people stay with sociopaths in the hopes that they can get back to that honeymoon phase. Nothing you say or do can change your partner, and it is not your job to do so. This is her personality and it is her responsibility to seek treatment. There are treatments for this disorder, but typically those who have it are unlikely to seek professional help. For those that do decide to seek help, they are likely to go because of a secondary issue such as substance abuse or court-mandated therapy after breaking the law. Personality disorders cannot be treated with medication. However, many sociopaths experience comorbid disorders, such as depression and anxiety, that can be treated with medications. It can be difficult and dangerous to end a relationship with a sociopath. He may become desperate and try to convince you that you are doing the wrong thing. When you don't give in, he may begin to show his hostility through physical violence or other manipulative or dangerous tactics. Sociopaths can experience a serious disconnect with their emotions and because of their unpredictability, it is best to seek out professional help if you decide to end your relationship. 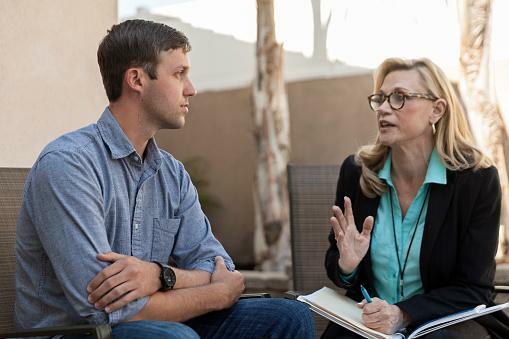 A therapist, counselor or trained crisis line professional can help you create a safety plan so you can remove yourself from the situation as quickly and safely as possible. You may experience emotional distress and may want to think about finding a regular therapist to help you process this situation. Take your time and be patient with yourself as you heal from this relationship. Make sure you fully process and understand how this type of person works, so you can avoid getting involved in a similar situation again.